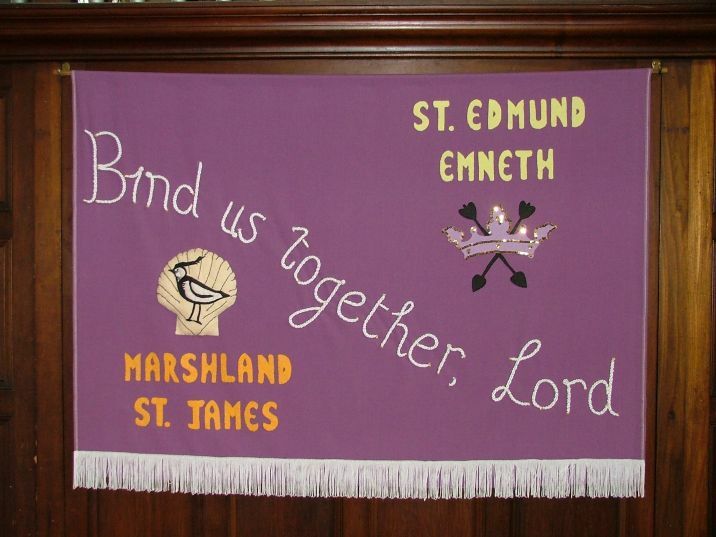 Out on the far edges of Norfolk, we left the Walpoles and the Wiggenhalls behind and entered perhaps the strangest part of this big county: the dykes, drifts and flatlands of the wide parish of Marshland St James. There was barely a tree in sight now, nothing but long straight roads that occasionally and abruptly veered off to cross a ditch or a dyke. Occasional houses were austere, understated; their little gardens were shocks of green, jarring in the vastness. Everything is visible here. There is no play of light, no subtlety of colour. No dark secret could ever be contained by this land; instead, the Fenmen and women would hold it, their natural reticence concealing it, men and women who were the land's before the land was theirs. Even the sky was leaden and brooding. I thought of what Seamus Heaney wrote about the old man-killing parishes of Jutland, although in truth this was a landscape I recognised, for it is so like the north of Cambridgeshire, where I was born. It was towards Cambridgeshire that we were headed. The fields as flat as seas stretched forever, the houses petering out and all the features of the land dissolving as if we were moving beyond a known country. Then our lane joined a wider road, and we turned up through Emneth Hungate; here was the house where the recluse Tony Martin famously killed a burglar, and was imprisoned for it. Suddenly, just before we left Norfolk altogether, we entered the surprise of a patch of suburbia, with semis, bungalows and older houses. This was Emneth. 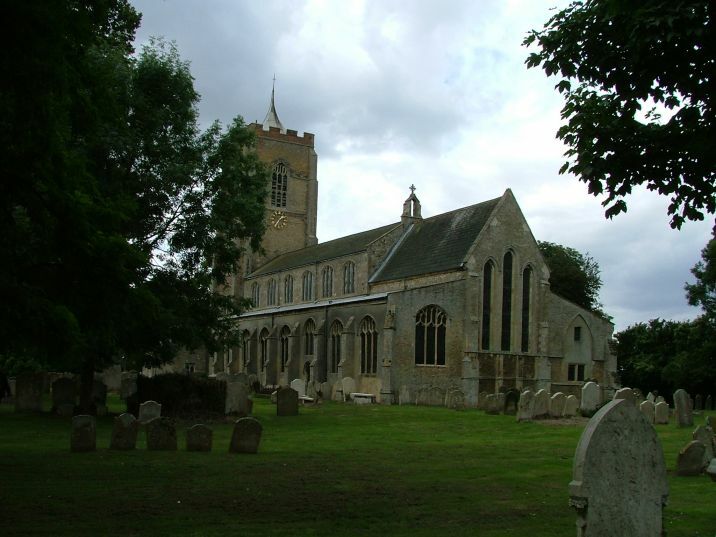 The road was busy; it connects the Cambridgeshire towns of Wisbech and Ely, and at its widest point it curves to reveal the large church and wide graveyard of St Edmund. 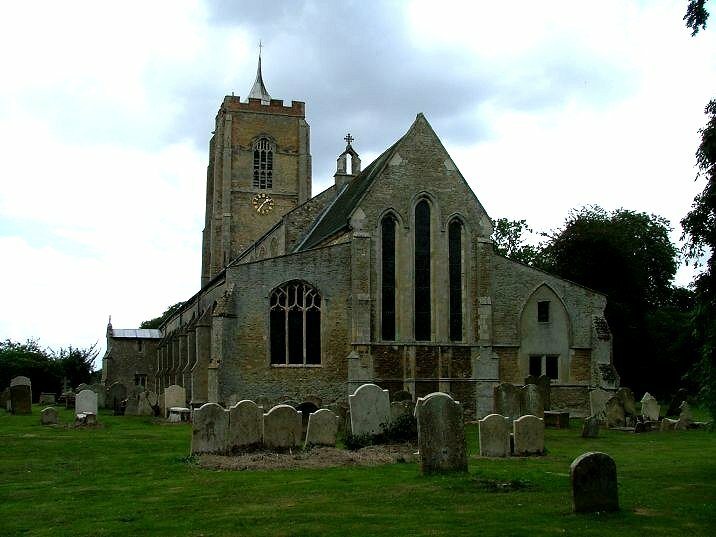 From either side this looks a typical late medieval East Anglian church, with aisles and a clerestory with enormous windows. 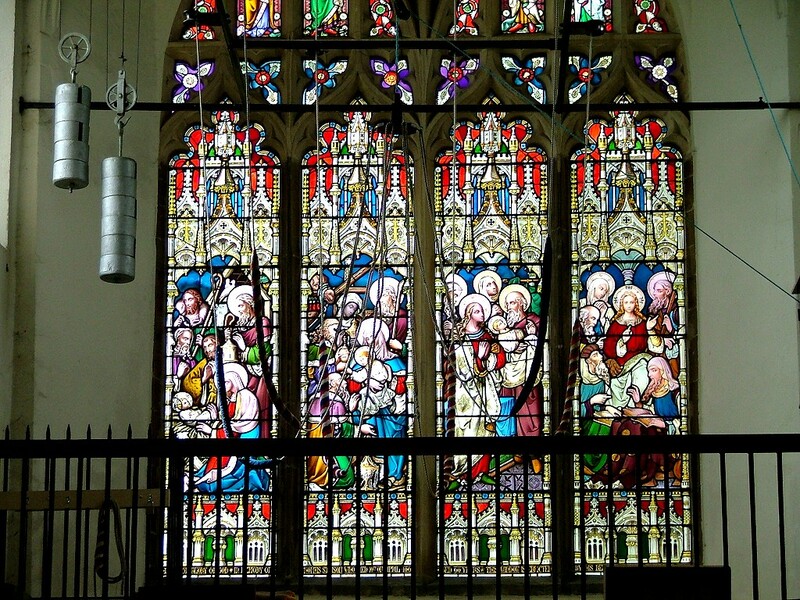 But when you see it from the east you are reminded that this is an area of England with many Early English survivals; the three lights of the east window soar to the rooftops. 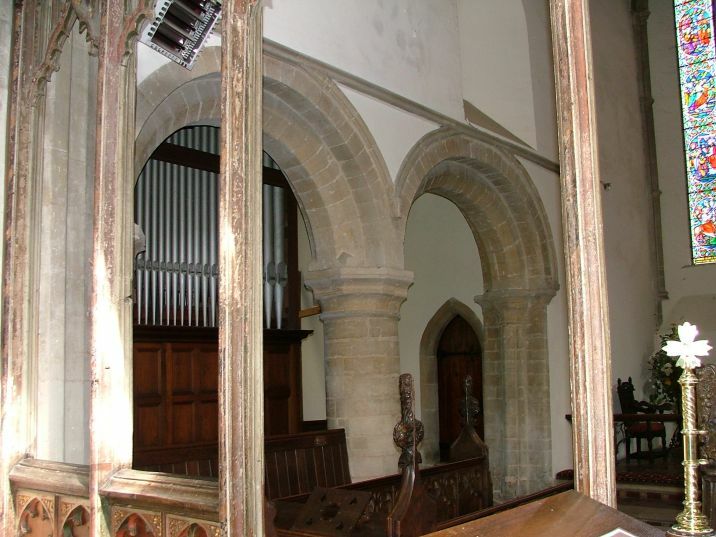 The 15th century aisles go right up to the east wall of the chancel, but in fact they disguise the fact that there were chancel chapels here before, and inside there will be evidence that they date from the early 13th century. 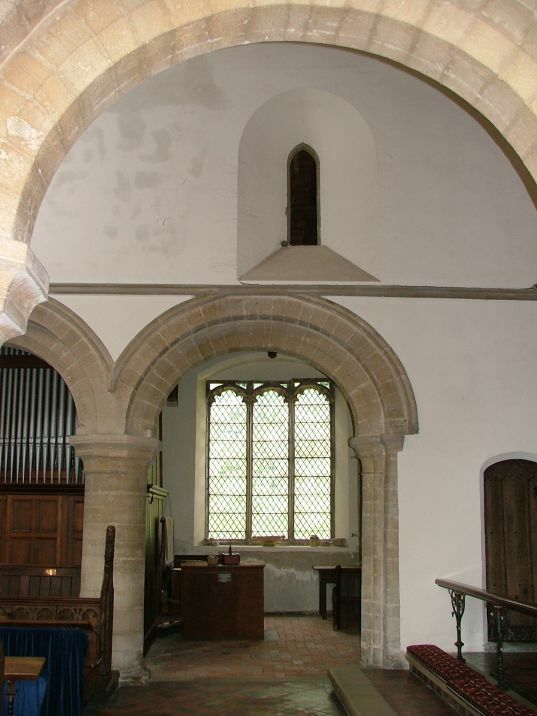 The northern chapel is now a two-storey vestry; Pevsner says that the ground floor has a tunnel-vaulted ceiling dating from about 1300. The tower is big, a solid reminder of late medieval prosperity. 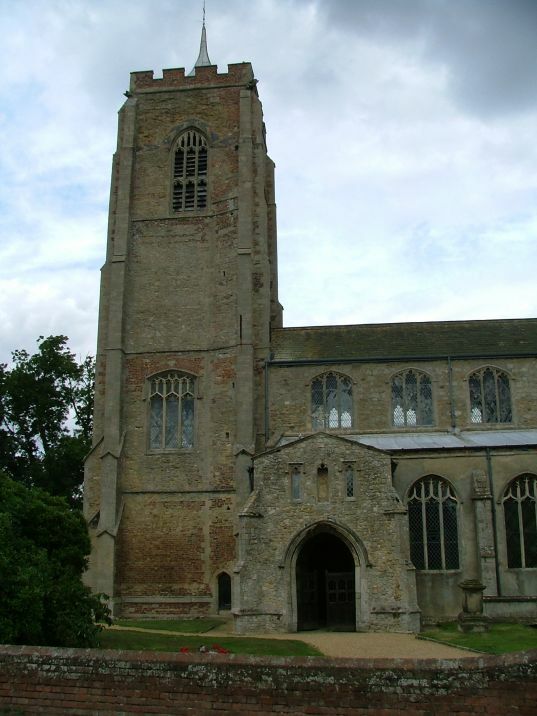 A little pointed turret on top is a quiet echo of the spires and steeples often found in this area of Norfolk and Cambridgeshire. You get the key from the Vicarage, a modern bungalow to the west of the church; it is kept in the porch on the eastern end of the house, the entrance to the Vicar's office. As you head back to the church you'll notice the fine village sign. The key lets you in at the south porch, which is big, but dwarfed by this great building. Before you let yourself in, you might notice the small door in the southern face of the tower. This leads to the west gallery beneath the tower; there is no access to it from within the church. 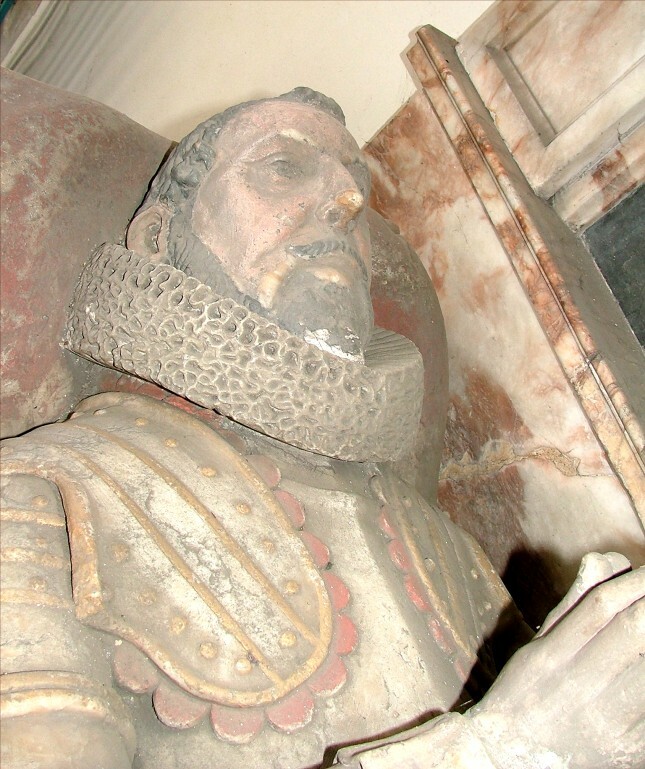 You step inside to a vast upturned ship of a church - this is every bit one of the great Marshland churches. White light from the clear glass in the large clerestory windows plays shadows and spills across the nave floor below. The arcades stretch eastwards like a forest grove. But, perhaps, there is a lack of atmosphere; for not only was the 19th century restoration a vigorous one, but as with any large church that has a congregation with a relatively low-church evangelical flavour, there is a feeling that this building is no longer a n act of worship in itself as its builders intended. 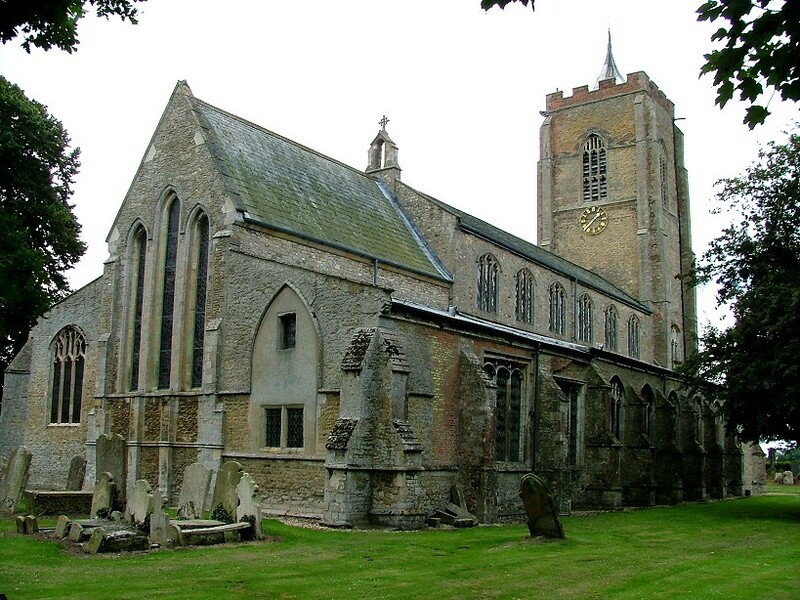 It is used, of course, and no doubt loved, and probably fuller on a Sunday than its high-church Anglo-catholic neighbour at Outwell; but, perhaps, it is not celebrated, and its Catholic past is not owned to the same extent by the present. 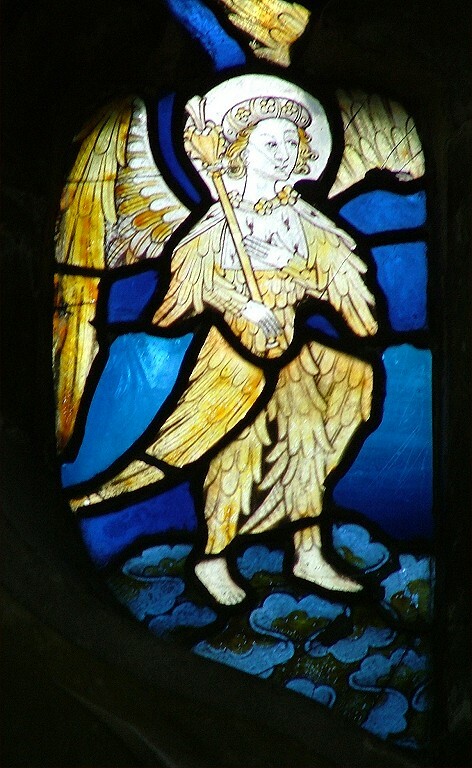 Although the Victorians removed much of interest, they did leave us some of the finest 19th century glass in west Norfolk. 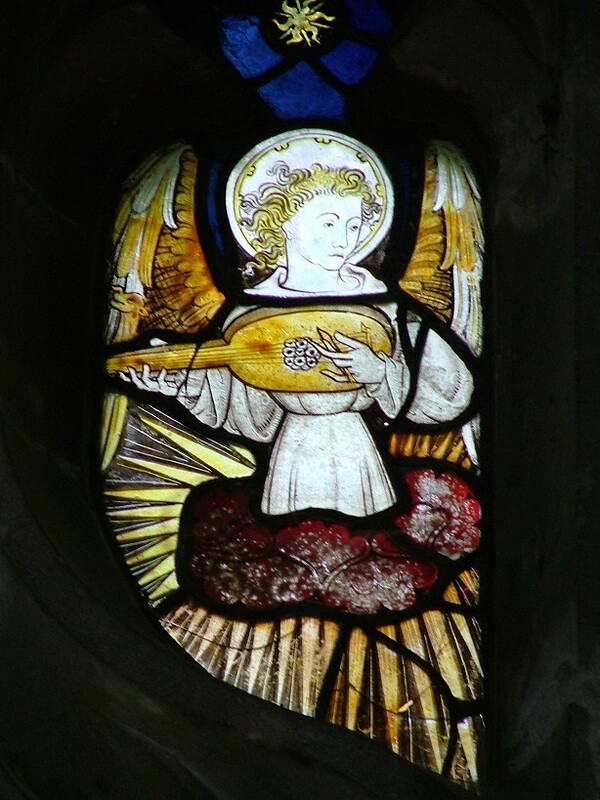 This is by the great William Wailes, and fills both the main east and west windows. 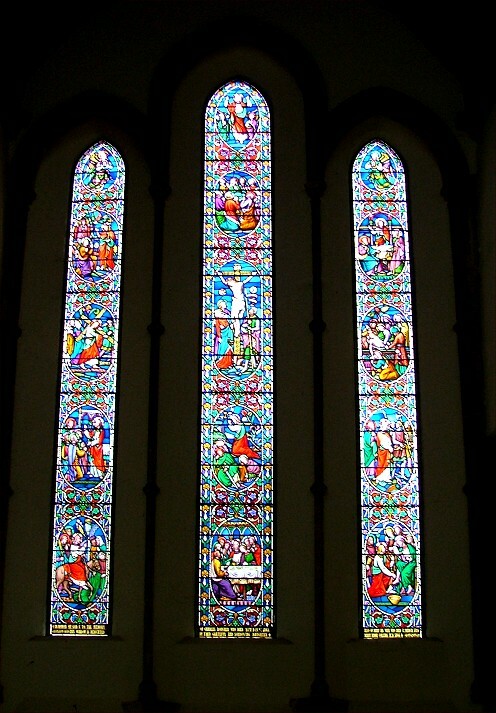 These windows are huge, so it is as well that their glass is so good. 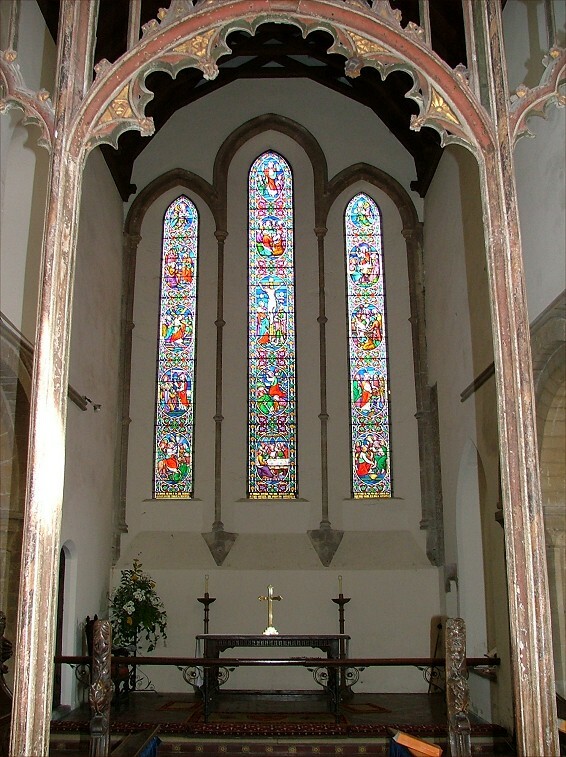 That to the east is very much in the 13th century style, as if this were the side chapel of some great French cathedral. That in the west is even better; it depicts the Adoration of the Shepherds, the Adoration of the Magi, the Presentation in the Temple and the Finding in the Temple, four of the glorious mysteries of the rosary. The view west in the church, the modern gallery with the glass as its backdrop, is lovely, especially on a bright afternoon, and makes up a little for the lack of atmosphere. 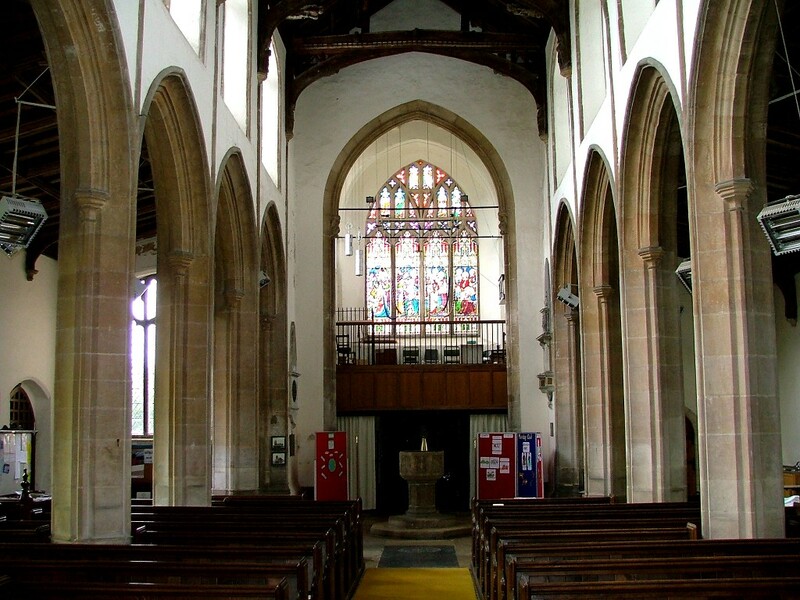 I should add that the late 20th century west end conversion of St Edmund is extremely successful, and this building is better suited than most medieval churches to its modern mission. 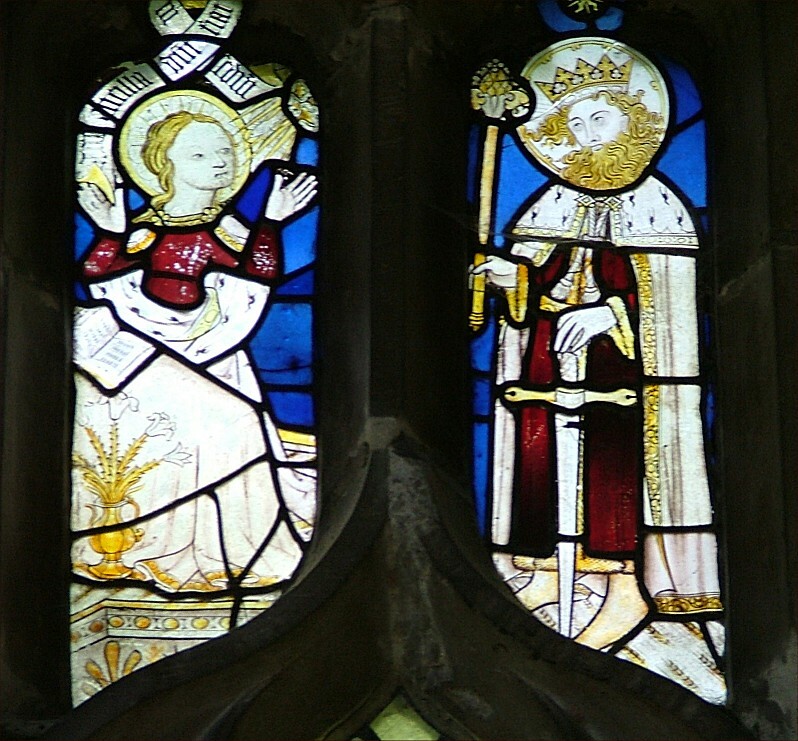 And there are medieval survivals, most notably a good collection of 15th century glass figures reset in the north aisle. 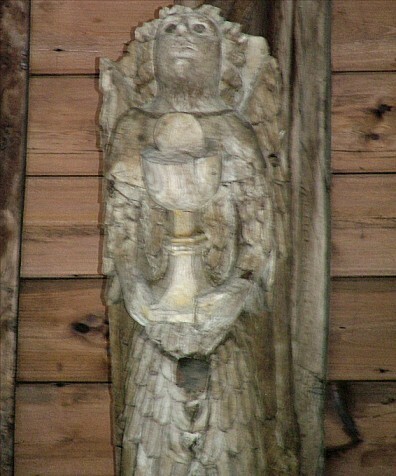 Some of them are composite figures, including a figure who is probably St Paul with a sword, but who has been given a king's head and set in the position of the angel in an Annunciation scene. 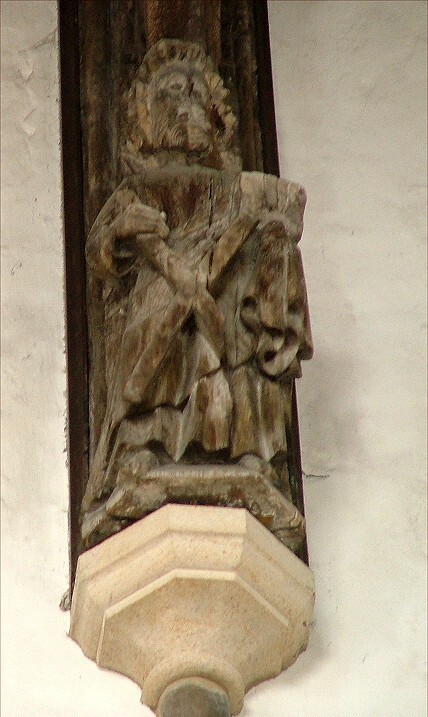 Under his feet are barleycorns, signature of the Norwich school. But the best is the gorgeous and rare figure of St Sitha with her bunch of keys. 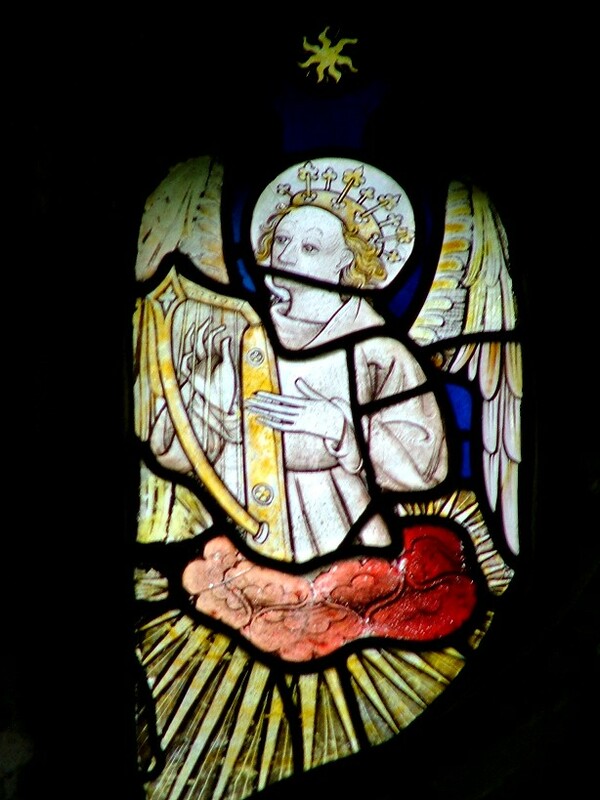 There are also some fine angel musicians. You can see some of them here. Hover to read the descriptions, and click on them to enlarge them. 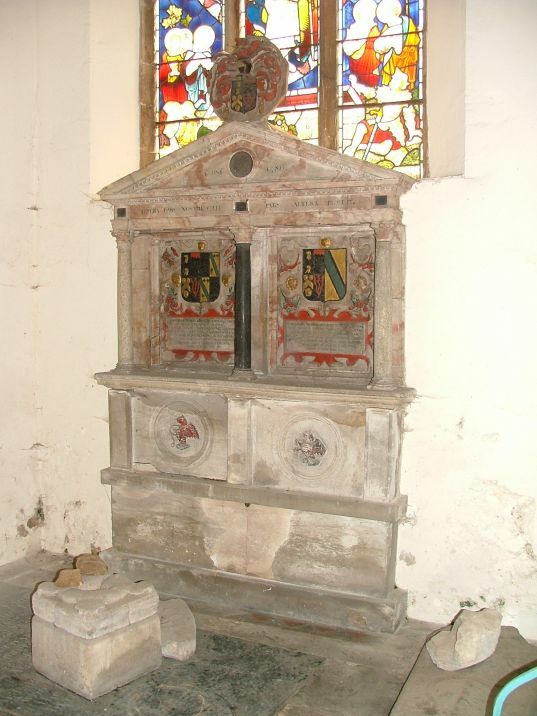 There is a good traceried font of the late 15th century, and the bones of a screen that are contemporary with it have some original paint and are elaborated with a new dado and coving. 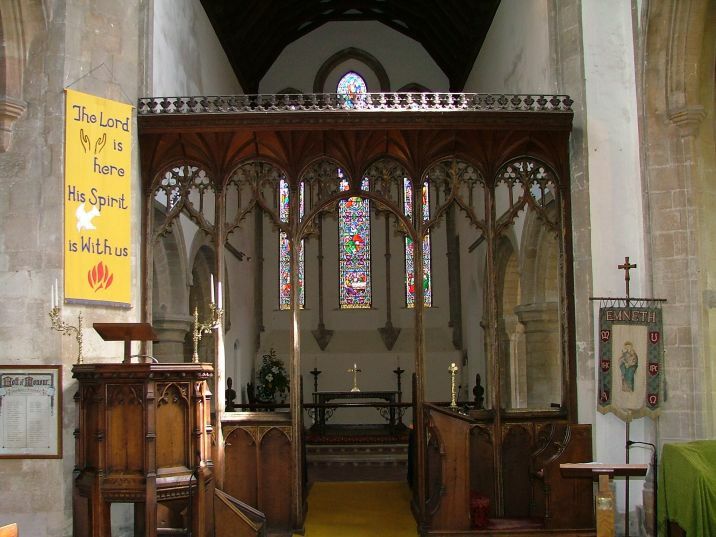 But the great surprise that St Edmund has to offer is immediately apparent as you step through the elegant doorway of the roodscreen into the chancel. 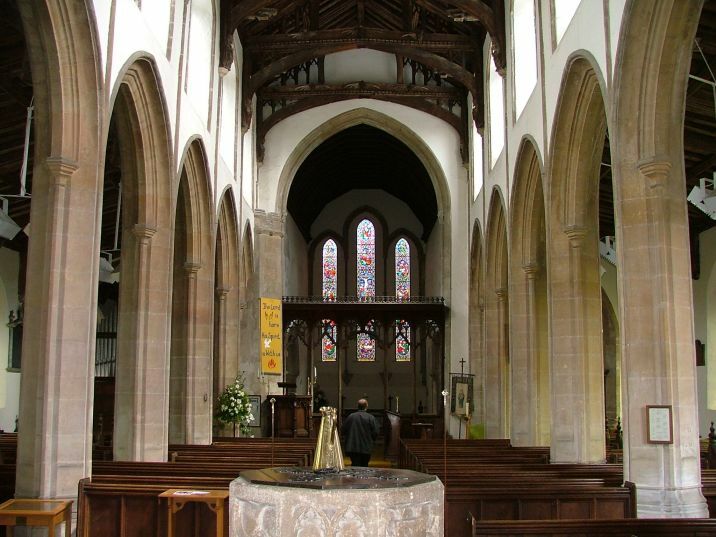 This is the superb pair of arcades dividing the chancel from its aisle chapels, gorgeous chunky round arches set on elegant capitals. 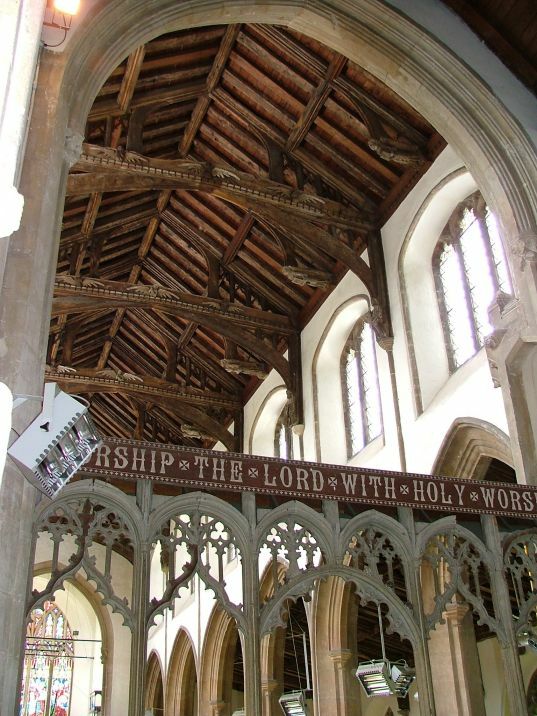 Pevsner took the motif of waterleaf mouldings on one as a guide to the date, which he puts at about 1210. 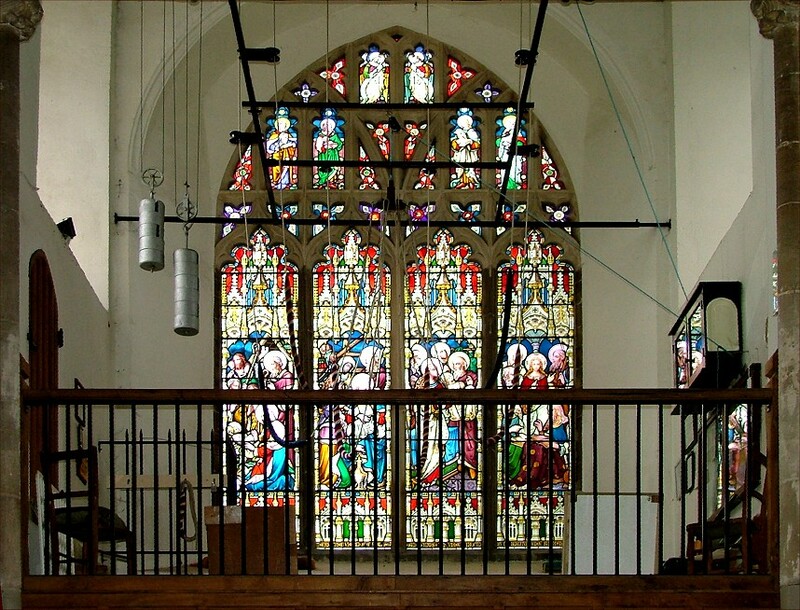 The south chapel is divided into two by a wrought iron screen with a gate in it, which you can step through into the mausoleum of the Hewer family. 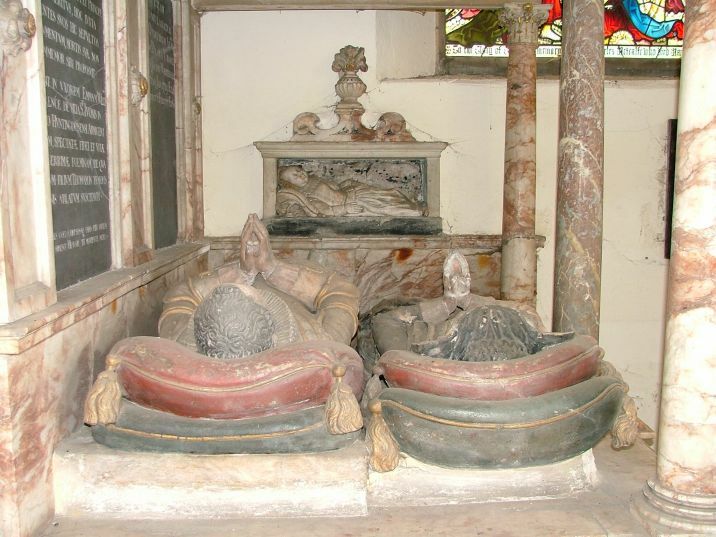 There are two tombs, one from the 1580s and the other from some 30 years later. They are for two Sir Thomas Hewers, father and son, and their wives. 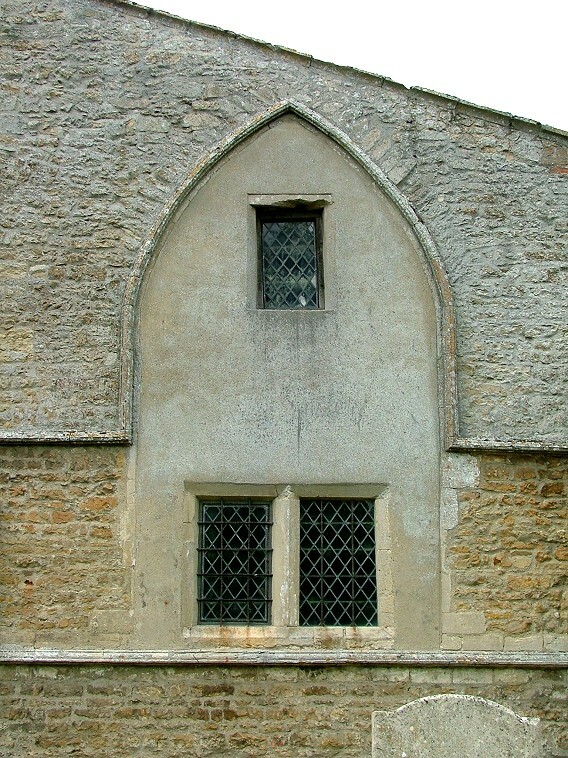 The oldest is against the south wall, set below the window splay, almost certainly in the place of a sedilia. 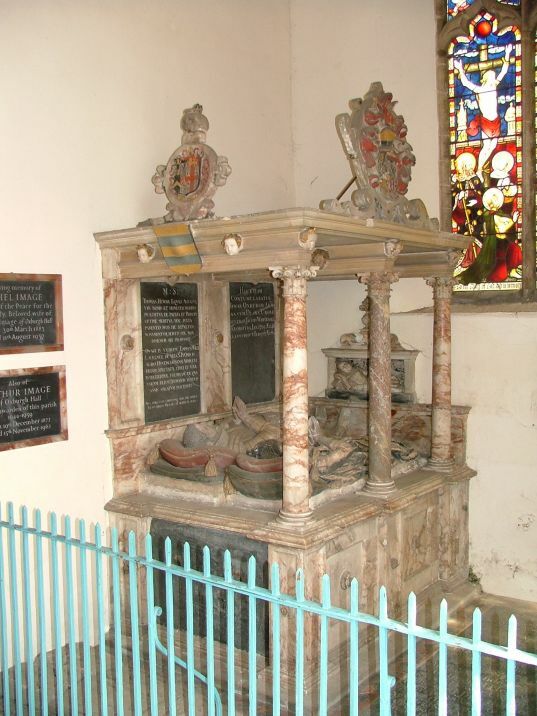 It is relatively simple, with original paintwork and inscriptions, but no figures. The one opposite is quite something else again. 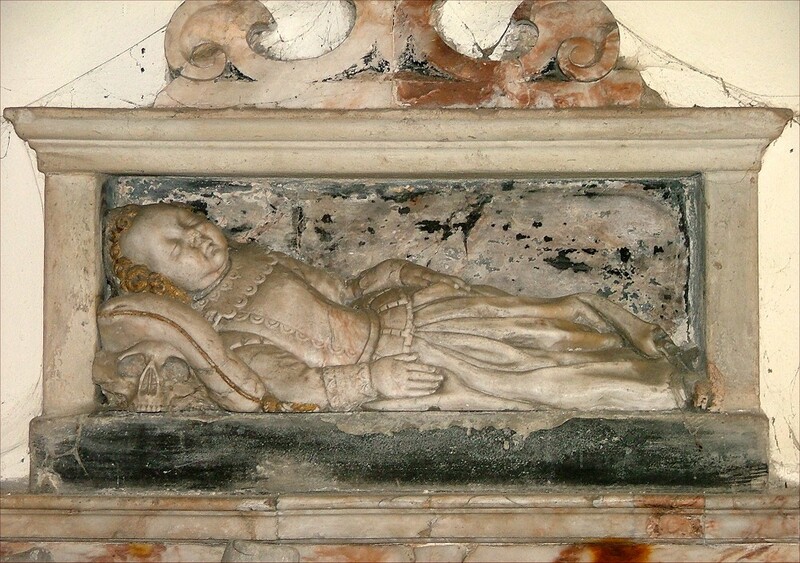 This, to the younger Sir Thomas, includes him and his wife lying in clothes that are convincingly late Elizabethan despite the date, under a canopy supported by marble pillars. 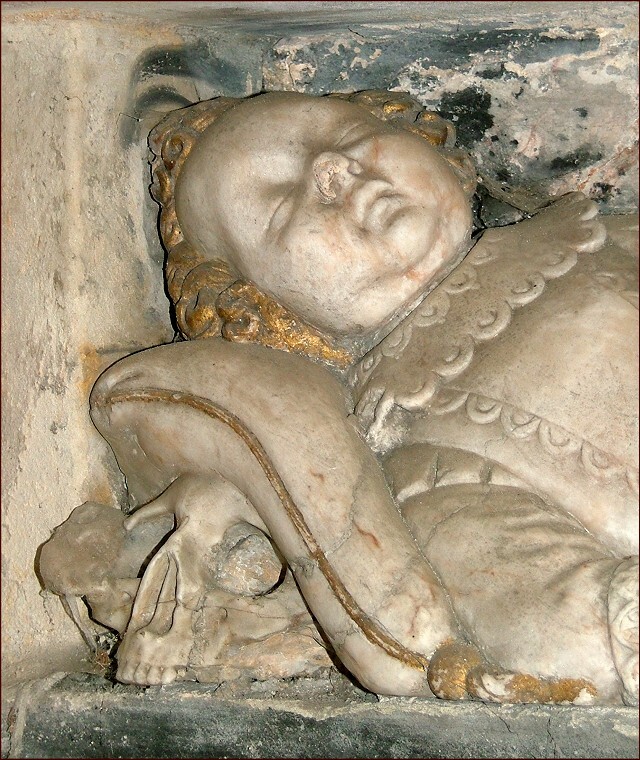 Most memorable is the recumbent figure of their infant son, his head resting on a cushion that partly conceals a skull, a stunning detail. 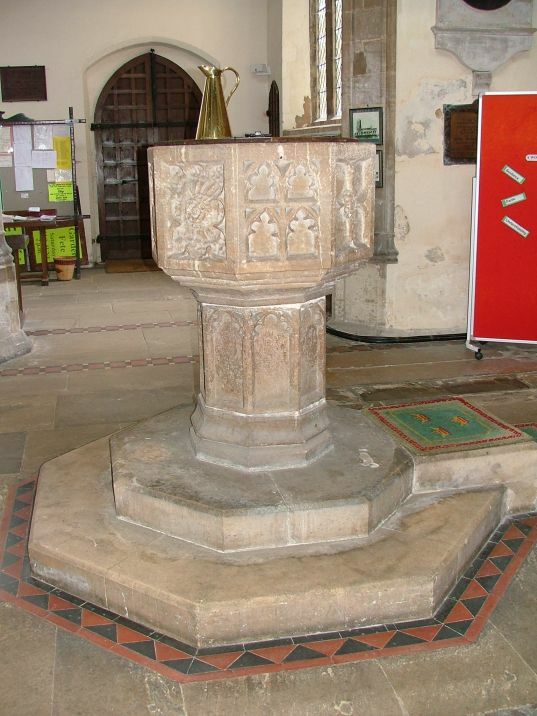 The whole piece is the work of Nicholas Stone, and Pevsner tells us that he was paid £95 for it. This church's remoteness from the rest of the county means it is less-visited than it deserves, but one thing that I have not yet mentioned is alone worth the visit. 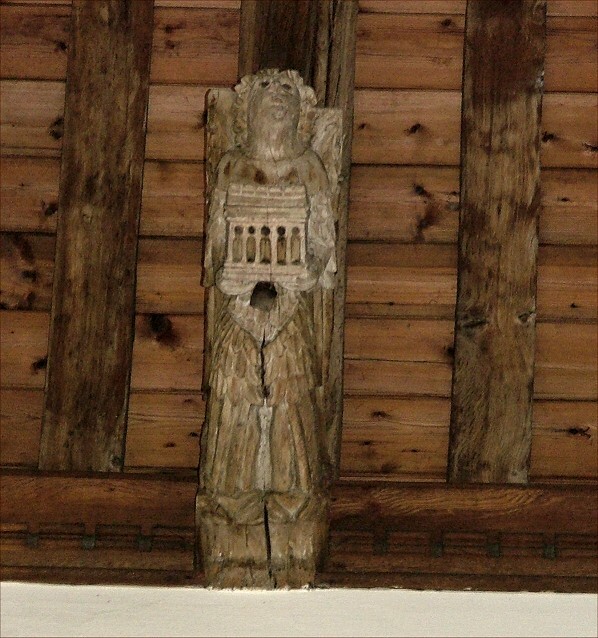 This is perhaps the most important architectural survival inside St Edmund, the 15th century roof, with angels on the hammerbeams and Saints in the wall posts. 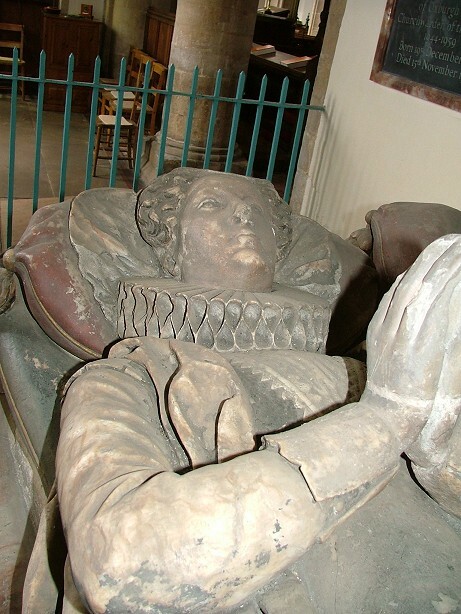 It is probably by the same hands as those at Outwell and Upwell. The roof has been restored, but the figures in particular have mellowed to a lovely silvery-grey colour. 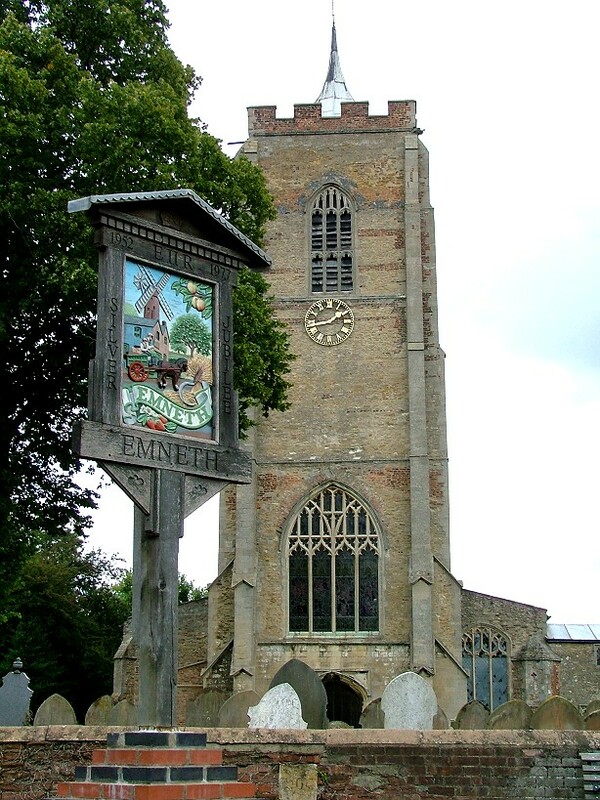 If Emneth were on the Cambridgeshire side of the border, then I have no doubt that they would be better known.